Committing time to training and service, and being ready to respond immediately when an emergency occurs, will necessarily affect the members of your immediate family as well. In addition to being proud of your decision, they should also understand their own role as the spouse, child, parent, or sibling of a volunteer. Family always comes first, and their support and cooperation will materially affect your ability to be an effective volunteer. To learn more about what it means to volunteer in your own community, speak with the recruitment coordinator at your local fire department or EMS unit. For helpful information regarding the respective roles of family members, the National Volunteer Fire Council (NVFC) has produced a booklet that you may find helpful. 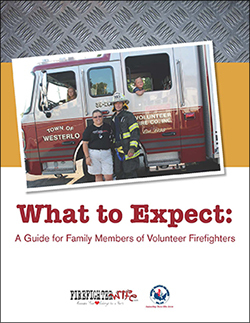 Download your copy of What to Expect: A Guide for Family Members of Volunteer Firefighters.